One of the most prominent trends in contemporary marketing is the convergence of content marketing and social media strategy; Marketo’s Head Strategist Jason Miller recently stated “this is the year where content and social will convene.” 76% of marketers share curated content on social media, the single biggest platform for distributing curated content. Communication between colleagues is critical to ensure that social media sharing matches the organization’s content strategy. 79% of marketers use social media to find content for their curation strategy, whereas only 63% rely on company newsletters and subscriptions. Developing a healthy social media presence is important to cast a wide enough net to find the right content. To truly gain attention for your content curation strategy, utilize hashtag searches and frequent monitoring to find information before it goes viral. Every company and marketer want to be known as the go-to source for information in their niche, and a healthy curation strategy can position a company as a thought leader. 85% of curators say establishing thought leadership is their main objective, a 6% increase over 2011. Not only is actively curating a valuable tool for establishing authority, it can help individuals build relationships with key bloggers and copanies. While authority is a primary draw for active content curation, 80% of marketers share 3rd-party content in order to improve company visibility and buzz. Positive SEO is a third benefit, particularly if content marketers share infographics and videos. Posts with video attract 300% more inbound links. Consumers are living through what’s been described as “information obesity,” and brands with a critical approach to curation realize that sharing low-quality, mediocre, or old content won’t do their company any favors. Before you share an article, or embed a video, consider whether it’s relevant to your audience, and sufficiently high-quality to represent your organization. In fact, 30% of marketers report it’s harder to find quality information than it was in 2011. To combat the unique challenges of content curation, organizations are increasingly turning to official systems, processes, or resources to stay organized. Organizations must develop a system of internal communication and quality-checking before they publish 3rd-party information. 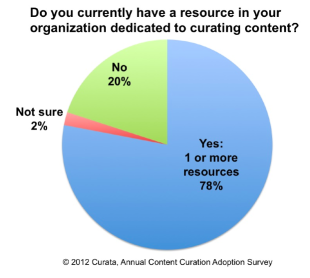 Curata found that 78% of marketers are using at least one brand-wide resource to compile, and annotate links for content curation. Web experts predict that in the future, the total information on the web could double every 72 hours. While Google, Bing, and other major search engines are actively working to improve their algorithms, expert Rohit Bhargava believes that search might not be sufficient to find the right insights in the future. Instead, content curators could develop dedicated followings as voices for the social web. The best-known marketers, including Seth Godin and Chris Brogan, didn’t develop a reputation by intermittently blogging, or occasionally accepting speaking engagements. Content curation requires continual commitment to delivering breaking news, and distilling the noise around a given topic. Determine how curation fits into your organization’s content and social strategy, and stick to what you’ve started. If a company is producing the most brilliant content that no one is reading, will it still rank high in search? Unfortunately, probably not. Social signals are beginning to matter more than ever in SEO, which is why a content marketing strategy is only as strong as its community. Fishkin recommends actively networking with other content creators to develop planned curation, with an end goal of increasing your audience. Aggregation: the most-common form of curation, companies compile relevant information on a given topic into a single location. Distillation: Sharing only the best insights on a highly-popular topic, by embedding the best Tweets or quotations. Elevation: Drawing conclusions on trends or issues by analyzing social posts. Mashups: Blending original and curated content into a fresh, original take. Chronology: Developing a timeline of events, using links, social posts, and other curated media. If you thought the rules surrounding content curation resembled the Wild West, there’s a significant movement to establish widespread, professional ethics. While many have addressed the importance and etiquette of proper attribution, The Curator’s Code addresses common questions in-depth. As the concept of a filter becomes more important to consumers, the value of a curator soars. In fact, Bharati Ahuja of Search Engine Journal predicts that Google could even roll out Curator Markups in the future, as a recognized alternative to authorship. 64% of content creators struggle to produce enough quality information to establish an engaged audience. Boost your company’s visibility and reputation by incorporating content curation. Are you currently curating content as part of your content marketing strategy? 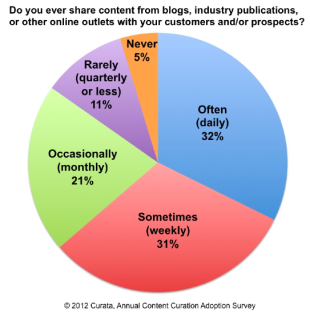 How often do you share 3rd-party content?